I could, and will, ramble on much longer about aquafaba awesomeness, but not yet. Because, today Sarah and I pulled off a super efficient and productive aquafaba playdate, yielding five glorious festive creations highlighting supercalegumerific exgarbanzolisciousness. And I'll need a little time to type that up. 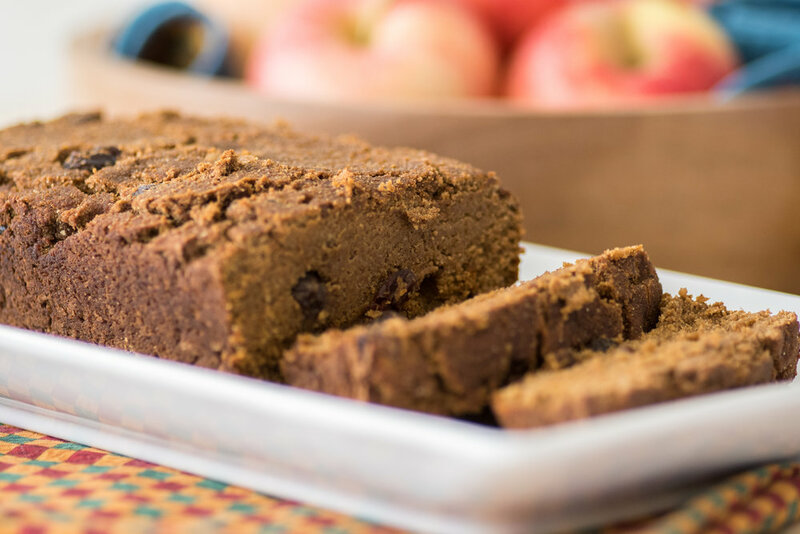 In the meantime, consider the warm spice and richness of pumpkin gingerbread that happens to be pretty low sugar (maple syrup and molasses sweetened), easily tweakable, vegan and gluten-free. This was inspired by a beautiful pumpkin gingerbread from Oh She Glows. I expect you could pull off any favorite flour or gluten-free blend, but I do think that the 1/2 cup coconut flour and 1/2 cup almond flour mix for half of that makes for a really nice, almost custard-like texture that works. I used 1/2 cup chickpea flour and 1/2 cup sprouted rice flour for the remainder, but only because I had a bunch of remnants in bitty bags that were cluttering my cupboard. The combination was just right, but so could have been others. Try and see. On that note, remember that time--also ten days ago, that same time I was talking about before--when I implied I would make an effort to post recipes I wanted to record even if there wasn't time to say a whole lot about them? This is me attempting to follow through on that. Happy Thanksgiving! Combine first five ingredients (pumpkin through aquafaba) in a medium-sized mixing bowl and blend well. In a large bowl, combine the dry ingredients. Add the wet mixture to the dry, and stir well. Stir in raisins and chopped ginger, if using. Pour the batter into a loaf pan coated with cooking spray or lined with parchment paper. Bake for approximately 55 minutes or until an inserted toothpick comes out clean.